This entry was posted on Saturday, September 16th, 2017 by Frances Ryan. It has been about four months since I started taking tolvaptan, which is a great opportunity for an update. As with the post I shared about my experiences in the first month, the information shared here is meant as an information starting point. It is not medical advice; it is simply one woman’s experiences. Your own experiences may vary. 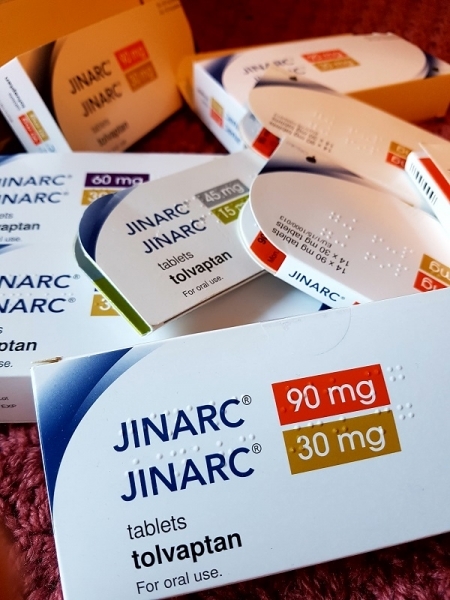 Tolvaptan is meant to slow the progression of my kidney disease (polycystic kidney disease, or PKD) which is the best I can hope for as there is no cure for it (yet). You can find out more about the drug and its availability here. I am still getting used to the side effects of the drug, which I explained in my “first month” post here, but I feel that I am doing quite well on it (mostly). My hope is that I will continue to improve my understanding of the drug’s side effects and, therefore, minimise the negative impacts on my daily life as much as possible. I stepped up to the top dose (90/30mg) after four weeks on the middle dose (60/30mg). At the time, I worried that the side effects would increase dramatically. I worried that I would be drinking a considerable amount of extra fluids and waking more than once each night to urinate. However, I don’t feel that the overall effects were that much greater. For the record: I have been on the top dose for ten weeks now. What I did notice about stepping up to the top dose, at least in the first week or so, was that I wasn’t sleeping through the night at all. I had managed a few full nights’ sleep on the middle dose, however. Since those couple of weeks, my sleep has improved and I am now at a point where I sleep through 4-5 nights per week, only waking 2-3 nights. I will talk more about this in the sleeping section below. Overall, the difference between the middle and top doses haven’t really been a bother for me. Well, except for the liver test which I will also discuss below when I talk about monthly lab work. Tolvaptan is meant to be taken twice per day: once in the morning and once about eight (8) hours later. The first pill is meant to be taken on an empty stomach, after which you aren’t meant to have food or beverages (other than water) for 30 minutes. I like to start my mornings with a cup of coffee. But I also like to lounge in bed for a while after my alarm clock goes off. So I have started placing my morning dose in a small glass beside my bed the night before, along with a large bottle of water. When I first wake up (normally around 6:00 am) I take the pill. Sometimes I go back to sleep for a bit, sometimes I check email or Facebook on my phone, and (far less often!) I get straight out of bed. After taking my first pill, I also set an alarm on my phone to go off in eight hours. I struggle to remember to take pills because I don’t generally have a daily medication routine, so this helps me remember—especially when I am having a busy day where time escapes me. This is even more important because the timing of my morning pill varies based on the time I wake up. That means my second pill is taken at different times each day. Again, my lack of routine might mean the second dose was forgotten if not for the alarm. The nice thing about taking tolvaptan is that you can take a break when you need to. (Though this shouldn’t happen too often, as the more regularly you take it, the better your results!) It is quite “fast acting” which means that skipping a day has an immediate impact on your thirst and urination. I travelled home to the West Coast of America in August and opted to skip my pills that day. It was a 20+ hour journey (door-to-door) and I didn’t want to risk needing to pee (or being dehydrated) at an inopportune moment. I am very glad that decision was made as my location on the plane made getting out of my seat challenging! I also skipped my pills on the return journey. Again, this was a good plan! Despite being in a very hot environment, I continued to take my pills most days. I know some people skip the pills on holiday so that they don’t have to worry about waking during the night, but this isn’t an issue for me. I did, however, skip taking my pills on the day I hiked into Pete Lake. I didn’t want to be dehydrated on a mountain trail and I didn’t want to stop several times to pee in the woods. (I am a proud redneck woman and don’t mind peeing in the woods—I just didn’t want to hold up my hiking party!) I am glad I skipped the pills as the water we took would not have lasted us if I was necking it the whole time! Note: Most of my fluid intake is tap water and peppermint tea (which is naturally caffeine free). I do not count alcoholic beverages towards my fluid intake. On the middle dose, my fluid intake was around 4 litres most days. Once I jumped up to the top dose, this increased a bit. I am now drinking about 5 litres most days. Another reason for this over-hydration was that I was worried about under-hydration—especially as I heard others talking about drinking 10+ litres a day. But after a chat with my doctor, I was left feeling more comfortable with a lower intake. I was essentially told that I needed to be drinking enough so that I wasn’t thirsty but that I didn’t need to drink non-stop all day. I increase my water consumption if I know I will be drinking alcohol (even just one drink!). I also drink quite a bit more on days that I run or do other strenuous activities (especially in the heat). Because of the increased thirst, many people on tolvaptan tend to wake during the night to urinate—sometimes three or more times! In my first month, this was not a big issue for me—in part because of the lower doses. However, when I started the top dose I found that I was waking most nights. Thankfully, that has improved for me and I am now at a point where I sleep through 4-5 nights per week, only waking 2-3 nights. When I do wake up, it is only once and I am almost always able to get back to sleep with ease. I tend to drink a glass of water when I am up as well since I generally feel quite thirsty when I wake. Most nights, I manage to sleep through until around 6:00 am. I have found that those nights are when I have “front-loaded” my fluid intake in the first half of my day. So, if I have a typical day in the office, I can drink a great amount of water and peppermint tea throughout the day. This means that I am not as thirsty in the evenings, which means I’ve had less water in the hours right before bed. And that means that my bladder can hold onto whatever urine it’s holding until the “wee” (pun intended) hours of the morning—right around when my alarm is meant to go off. And that then means I don’t really have to worry about getting a couple hours’ more sleep. On the days when I am not in the office or when I am running around between meetings and various appointments or errands, I am unable to front-load my fluid. And that means that I find myself feeling thirsty and a bit desperate for water. And once that thirst has been felt, I find it difficult to satisfy. Which then means I am drinking even more water all evening long. And that’s when I find myself waking up in the middle of the night. My “middle of the night” wakings normally happen between 3:30 and 4:00 am. For me, that is too early to just get up and too late to get a solid post-waking sleep. One thing I try to do when (and if) I do wake in the night is to keep my eyes shut and the lights off as I feel my way to the loo. This way, I don’t have bright lights to stimulate my little brain. I also try not to look at my phone when I get back to bed. By doing this, I am better able to get back to sleep quickly. If I fail in my attempts to not look at my phone, I tend to get sucked into something on the bright screen and it can take a long while to get back to sleep. I’ve never been a heavy drinker, but I have found that even my light-to-moderate intake is not enjoyable with tolvaptan. Before starting the drug, I could have 1-2 drinks without feeling any ill effects the next day. But now, I sometimes find that even one drink can make me feel very dehydrated the following day—as if I’ve had several drinks, only without the rest of the hangover feelings. This means that I am often a bit hesitant about the idea of a glass of wine because I don’t want to feel rough the next day. However, if I manage to get enough water in during the day, the effects of that one drink don’t seem to bother me. On the couple of occasions where I’ve had “too much” to drink, I knew in advance I would be having 3-4 drinks and really hydrated up beforehand and drank a glass of water in between each booze-based drink. I am pleased to say that doing so has helped—but I am also aware that those 3+ drink days needs to be extremely limited now. Ultimately, I think this will mean I drink less alcohol when I’m taking tolvaptan. That won’t really impact my social life (and will probably improve my running times! ), but I do worry that I will find myself apologising for not drinking. Especially when I am in a social situation what would typically include alcohol. As a UK-based academic, this may be a bit awkward. But I have to put my own health ahead of others’ inability to drink around a sober person. As part of the tolvaptan programme, patients are required to have monthly blood work for the first 18 months, and every three months after that. In the first couple of months, there are in-person meetings with the doctor to ensure everything is going OK. After that, in-person appointments take place every 3-6 months with blood work happening every month (or every three months as time goes on). My tolvaptan team is based at the Edinburgh Royal Infirmary. They work with patients to ensure monthly appointments are easy to manage. This includes working with your GP (if they agree) to do the blood draws at your local practice, saving a trip to the infirmary. My GP is happy to do this for me, but I have yet to arrange that process. When I do, I will simply attend my local surgery the day before the tolvaptan team meets so that they have my lab results when they review their patient list. One of the primary reasons for this blood work is to test liver functions, as there is a risk of decreased liver functions when taking tolvaptan. (Though I understand that this is reversible on ceasing the drug, should this be an issue for you.) And my July blood work did, in fact, show that my liver enzymes were slightly elevated. This worried me, but my doctor deemed it mild enough to simply monitor. When I had my August blood tests, my levels were back within the “normal” range and my September tests showed that they were slightly better than August. I am, of course, still a bit worried about this. However, my doctor seems unconcerned and will just keep monitoring the levels each month. An aside related to alcohol consumption: I wonder if drinking impacts these levels. I know that, in general, high volumes of alcohol can cause liver damage. My consumption has never been at those levels and my doctor doesn’t seem concerned about my consumption. So, it may well be my worrisome brain trying to overthink things. And in the two weeks before my September test, I haven’t had any alcohol as I was training for a half marathon at the end of the month. Still, limiting my booze to eliminate the dehydration can’t be a bad thing for my liver! My tolvaptan team (which includes a dedicated pharmacy consultant) run monthly tolvaptan clinics that pull from a large population base. This means that they are able to ensure the in-house pharmacy is well-stocked with tolvaptan. My first two months’ supply was provided at my appointments as a single month. My second two months was a doubled prescription because I was away on holiday for a few months and would be unable to collect month four. At this month’s appointment (blood work only), the pharmacy consultant explained that I would be given a repeat prescription for six months, receiving three months at a time. (She reminded me that I still need to attend the monthly blood work appointments, as this is very important.) I picked up the first three months from the hospital’s pharmacy. The second instalment will be waiting for me at the appointment desk when I come in for my monthly blood work in three months’ time. Overall, I feel that these four months have been an acceptable experience. Sure, I would prefer to not have the side effects. However, I feel that the side effects are mild enough that the benefits far outweigh any negatives. I don’t know if I would feel the same way if I was one of the people indicating that they drink 10+ litres of fluid per day or that they wake up to urinate 3+ times in the night. And hopefully, my experiences don’t start mimicking those people’s experiences! I do feel quite lucky to have the opportunity to take tolvaptan though. Especially as I am an American and the drug has yet to be approved for use by PKD patients in the states. (Yay for expat life!) Also, in Scotland tolvaptan is approved for people with Stage 1 kidney disease, which is where I fall on the spectrum. So if I was elsewhere in the UK I wouldn’t have this opportunity, either. So, I guess I’ve hit lucky there! As tolvaptan is meant to slow the progression of PKD by about 30%, I figure these four months have given me another month’s time on my original kidneys, Bob and Dave. And with each day added, that’s another day for those clever scientists to figure out a way to stop this disease altogether! I have a hereditary kidney disease where cysts grow on them. I have been recommended by my kidney doctor to try Tolvaptan, but first I would try to find out more about it first. So I have been searching around, but only been able to read diificult medical reports. This was a very nice post to understand how those who take this medicine have it in everyday life. I have been worried about how it would impact my daily life. How would it impact on my training (I’m jogging a lot and playing golf), but I can see that you are even more active than me, which makes me more relaxed. I have also been worried whether it will affect my ability to be active with my 3 children and whether it will affect the enjoyable moments taking a glas of red wine or a beer now and then. Thanks again for an informative post. Now, I can talk to my doctor with more understanding to see if I should start with Tolvaptan. Good luck with your life with kidney problems and the use of tolvaptan. I wish you the best. Hello, Svein. Thank you for your comment. Is your disease the same as mine (polycystic kidney disease) or is it something different? I know that the tolvaptan studies are all based on PKD - I don’t know if it works for other diseases. I really have had an easy time with it - even when being quite active. But I know that others have found it more challenging, drinking a lot more water than me and waking in the night 2-4 times to urinate. But I also get the impression that most people are very happy with it. There is a group on Facebook specifically for people taking tolvaptan for PKD. Most of the members are in the UK but there are a few from around the world, too. It might be a great group to join if you have any questions. We’re a quite friendly and helpful lot! Of course, I’m happy to answer any questions you have here, too! Thanks for the reply (and sorry for my bad english). And thanks for the facebook-tip. Yes, I have autosomal dominant polycystic kidney disease (ADPKD), but have not had any problems yet, so I’m feeling perfectly fine. That’s why it’s a bit frightening for me to start on a medical treatment. But I know that it would be wise to be in front of the disease before it develop even more. My sister has the same and are in dialysis right now, waiting for a kidney transfer. Mostly I’m concerned about the effect that tolvaptan can have on the liver (ref: http://www.cardiobrief.org/2013/05/01/fda-warns-that-tolvaptan-can-lead-to-serious-liver-injury/), but I guess I have to trust the recomandations and knowledge from the kindey doctors. I will for sure join the facebook group. Yes, there are risks of elevated liver enzymes. From my understanding, this is most often to be found within the first 18 months of starting the drug and that when stopped, liver function returns to normal. In the UK, the treatment protocol is set up to look out for that specifically. In the first 6-12 months, blood work is done monthly and you will not be given pills if there is a problem. After that, monitoring goes down to (I think) every 2-3 months. I had a slightly elevated liver test a couple of months ago, but the following month it was back to normal. I know from the Facebook group that others have had similar experiences. So don’t worry too much about the liver stuff. If you do have an issue, you just stop taking the medication - and the overwhelming odds are that your liver will bounce right back. But, of course, you’ll want to discuss all of that with your doctors. Have you seen an reduction in “feeling” your kidneys or total kidney volume since you started? I’ve been told it can potentially do that. It’s not available here in US yet, but my doctor says it should be by end of year. Hi, Patrick. Thanks for your comment. I am really looking forward to the drug being approved in America. I am an American (expat living in Scotland) and whilst it’s too late for my sisters and the older generation (mum and her siblings) it would be great for my nieces and nephews with the disease. If I’ve misunderstood your question, please do let me know and I’ll try to re-answer! Hi Frances. Thanks for the great post. I was just interested to find out how big your kidneys are? I found out a few months ago that I have pkd after an ultrasound. My kidneys measured something like 16cm and 20cm long, which is pretty big. Luckily my function is also normal, for now, but I can’t see it staying that way if they keep growing. I would imagine that this classifies as “large” and I applicable for tolvaptan in Scotland. So going to Scotland is seriously on my mind! Thanks again for the great blog. Hi, Mark. Thanks for getting in touch! My kidneys measured 21 and 22 cm a little more than a year ago. I would assume they have grown slightly since then. I know that some of my cysts are 6+ cm, too. Interestingly, some people manage to maintain a decent level of function even as their kidneys grow larger. It really does vary from one person to another. Part of the reason I was able to start the drug whilst at Stage 1 is that I have a family history of early decline. One of my sisters had a transplant when she was younger than I am now, and another (4 years older than me) is on the transplant list now. My mum, an aunt, and an uncle all had transplants in their 50s. Thankfully, my function is still holding steady for now though! Where are you located? Is tolvaptan available at all where you are? Hi Frances. I’m in South Africa and Tolvaptan is not available here - I expect it’ll take a LONG time for it to find it’s way here! My PKD appears to be de novo, in that it doesn’t look like my mom or dad have it. So it was a bit of a shock and quite unexpected to get this diagnosis earlier this year. I’m 35 currently, and hoping that I’ll maintain perfect kidney function into my 40’s, but I am worried about the size of my kidneys, as I believe that this is what ultimately leads to deterioration in function, hence my question to you. On the flip side, it does look like there is a great deal of research going into therapies other than Tolvaptan for PKD, which I’m happy about. My hope (and it’s a long shot) is that something can be done to stop cyst growth altogether before things progress too far for me and everyone else. I’ve said to others, there’s probably never been a better time to have PKD! If it comes down to it though and better therapies aren’t identified (e.g. Niacinimide) then I would seriously look at moving to a place like Scotland as well! I wonder if you’ve been keeping up on “water therapy” related to PKD. It seems that there are studies showing that a high volume of water intake can slow the growth of cysts. Of course, there are risks to overhydration, but the water therapy is based on drinking water over the course of the day as opposed to all in one sitting. There are ongoing studies and a great amount of literature (academic/research and anecdotal) online. You can find quite a bit of information by searching “pkd water therapy”. Just mind that you evaluate the sources because you’ll probably know that there are a lot of “alternative medicine” sites out there that offer quite dangerous “treatments”. Please note the following disclaimer: I am NOT suggesting water therapy as medical advice for you specifically. I am merely suggesting that it might be something to look into and to talk with your doctors about. I am NOT a medical doctor and my comments/suggestions/thoughts are not meant to be a replacement for actual medical advice. If you do decide to give it a go (or to talk to your doctor about it) I would love to hear about your experiences! Yes, familiar with the view on water as a potential therapy. I have to say that prior to getting this diagnosis, my water intake was much lower - i was mainly a coffee guy! I’m following 2 pieces of research in this area at the moment, the first being the DRINK trial being carried out in the UK by the University of Cambridge (due to conclude end of this year iirc), and the second being carried out by the Rogosin Institute. This latter investigation actually has TKV as a primary output so I’m very keen to see the research which should be carried out for most of 2018. The former is due to conclude end of this year (exciting!) but I don’t think has TKV has an primary output. Both of the trials are small I believe. I have also read of research done by 1 group that indicated that excessive water intake could increase the rate of kidney function decline, so while the general thinking is positive, I do think it needs to be a bit more conclusive. Looking forward to the Otsuko (?) results of the extended Tolvaptan trial that are due out soon I believe, as I know that Tolvaptan generally leads to one needing a greater intake of water. As for myself, I sip on about 1.75-2l of water throughout the day, in addition to my normal fluids - a juice here and there, a coffee, and some decaf. At any rate, even with this intake, my brain should hopefully be suppressing vasopressin production better than it would have been before I started the extra fluids. Other research I’m very very interested in: Just this last month a phase 4 trial into Statin Therapy for ADPKD was initiated. It will use pravastatin therapy and have TKV measures as a key output of the research. It seems that in younger people and kids with ADPKD, pravastatin was demonstrated to reduce the rate of TKV growth substantially, while in older people (50’s) with more progressed disease, no significant differences were noticed. So I think this trial is taking everyone in between and measuring the results. I myself was already put on a statin - simvastatin - to lower my cholesterol profile, by my nephrologist. I’m very keen to see if this in conjunction with my moderately increased fluid intake has a positive impact on my kidneys when I go for my next check-in in about 8 months. Other reasearch I’m interested in: The Niacinimide trial (December 2017 for Phase 2 to conclude), and Lixivaptan trials - the latter is also a vassopressin regulator that is pipped as having less of a liver impact than tolvaptan. At any rate, the horizon for people with PKD is promising. I just really want it to hurry along so that I can get onto something safe and prevent progression while that is still possible! Wow! You are really doing your research! I am not familiar with all of these but know people who are (or were) in the statin trials. A niece in America is also on turmeric trials at the moment, so that’s another interesting possibility. I will have to read up on some of the research you’ve mentioned now! Yes, there are certainly a lot of promising treatments (and soon, potential cures?) on the horizon. Medical science is fabulous and it really is helping to improve the quality of life for so many people!! Thank you so much for your detailed account. I have just been suggested to start taking this medicine and wanted to find out more.